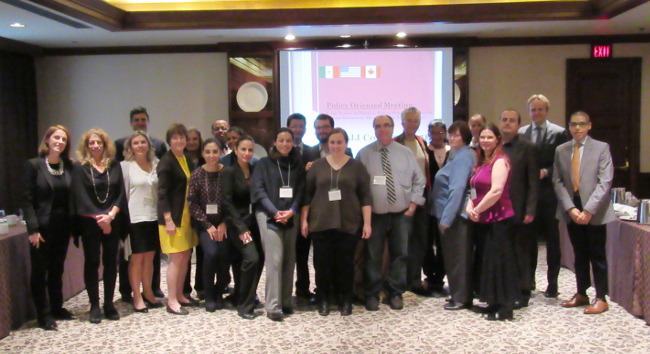 The Second Meeting of the North American Council for Juvenile Justice, titled "From Theory to Practice: How to Strengthen Juvenile Justice Restorative Mechanisms in North America", took place in Toronto (Canada) on the 5th and 6th of November 2015. The Second NACJJ Meeting was co-organised by the International Juvenile Justice Observatory, the Illinois Juvenile Justice Initiative, Loyola University School of Law, and the Former Secretary Florida Department of Juvenile Justice. Ontario’s Ministry of Children and Youth Services worked with them to facilitate the Toronto location. The meeting comprised firstly of a Conference, intended as a co-working day which was an excellent opportunity to exchange evidence-based good practices on child-friendly justice and give an overview of restorative justice in North America. A Policy-Oriented Event followed on the second day in which key elements in the process of building the NACJJ in the future were considered. Identified and discussed areas of common action for the NACJJ and established priorities for the next year. The North American Council for Juvenile Justice (NACJJ) is an initiative of the International Juvenile Justice Observatory. It aims to propose coordinated actions between experts and professionals in order to draft reports and policy recommendations; devise proposals; and develop projects in the North American region. In 2009 the IJJO launched Continental Councils for Juvenile Justice in Europe, Asia-Pacific, Latin America, North America, and Africa as part of its commitment to promote the improvement of juvenile justice systems and policies, and to ensure that activities are carried out with maximum proximity to real local situations, These Councils were created as cooperative working networks specific to the International Juvenile Justice Observatory, set up with the aim of generating spaces for analysis and reflection; developing initiatives; and establishing codes and principles of good practice across the different continents. In this way the Councils have been established as think tanks which bring together professionals and representatives of public authorities, academia, the judiciary, and civil society. The First Meeting of the NACJJ, which was held in Washington D.C. in December 2014, focused on the development of juvenile justice strategies between Canada, Mexico and the United States in terms of research and common action programs. During these two days, professionals and experts from the three countries defined the Council´s future steps for the coming years, in particular policy recommendations on restorative juvenile justice and on how to make deprivation of liberty a measure of last resort. The second day of the North American Council for Juvenile Justice’s Second Meeting, which took place on Friday the 6th of November, consisted of a policy-oriented event where the participants could engage in discussions on policies and challenges facing North American nations, as well as the future steps of the NACJJ. In an event prior to the Second Meeting of the North American Council for Juvenile Justice (NACJJ), the Juvenile Justice Initiative (JJI) and Illinois Balanced and Restorative Justice (IBARJ) held a discussion on November 3 called “Restorative Justice: The Northern Ireland Approach” in Chicago, Illinois, USA.